The urban skyline is dotted with magnificent high-rises. In fact, imposing skyscrapers now define the 21st century city. However, as much as we build our way upward, the finite space of our surroundings constrains us in a very significant way. Dealing with the space crunch is a real problem that everyone must deal with at some point. The main preoccupation of modern urban living is optimising the space in our homes. Maintaining a balance between the materialism of our lives with the reality of today’s space crunch is a delicate and often challenging process. Switch to using Murphy beds. A Murphy bed is a wall bed that is hinged on one end to the wall or any other strong surface. It can be stored vertically into the wall and pulled down whenever needed. Murphy bed design cleverly maximizes space and increases a room’s functionality. The regained space can then be used for exercises and workouts and also lends the illusion of space to your room. Build shelves around your windows and/or construct a bay window to optimise vacant space. This adds platform space to any room. Framing your windows also adds an aesthetic charm to your home. Floor-to-ceiling shelves in corridor spaces. Whether your corridor is big or small, using its walls to make floor to ceiling shelves is a quick, easy path to gaining more storage space. You can use these less conspicuous spaces to store shoes, tools, clothes or other items you don’t want on display. Window blinds that fold as drying racks. Our homes always have an assigned clothesline for laundry. However, in the process we tend to lose out on balcony space and/or end up sacrificing window views for a dry set of clothes. Attach window blinds which fold as drying racks to your window, these are absolutely inconspicuous and space saving. Once you’re done with drying your clothes, you can simply fold them back up and they become window blinds once more. Create a small loft in your bedroom. 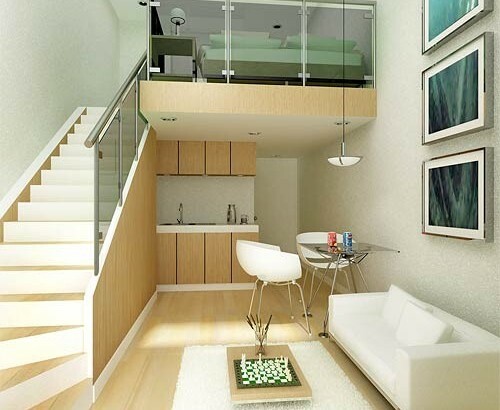 Lofts can be used to almost double up any space in your house. It is an extra storey created directly under the ceiling of a room to work as storage space. Lofts free up a great amount of floor space that can be then used to make a study or workspace. This solution works especially well for your child’s room and master bedrooms.